Teaching strategies for Asperger Syndrome are essential for any teacher with AS students. The students have difficulty navigating social situations, and as such, are often teased and used as scapegoats in the school setting. More so, they often have "odd" behavior such as being clumsy and being obsessive about specific subjects. Some strategies teachers use can make the classroom successful. Children who have Asperger syndrome often require their teachers to emphasize with their condition. No two children will display the same characteristics of AS. A flexible teacher needs to understand the most common characteristics of Asperger's syndrome and teach around it. Many children with AS are overwhelmed by even the smallest of changes. They are highly sensitive to their environments and rituals. When these are thrown off, they can become very anxious and they worry obsessively about changes in routine or unexpected occurences. There are ways to deal with this type of scenario as a teacher. Ensure the environment is safe and as predictable as possible. Keep transitions the same for as many activities as possible. A daily routine is critical. The children should know what to expect of the routine as this would help them to function properly and concentrate on the tasks at hand. Keep special activities or changes to the schedule at a minimal. Spend time preparing students for any special activities using a systematic approach. For example, create a schedule (many use pictures) that include a "special activity" segment as preparation. Although most children understand what a smile means and why someone puts out a hand to be shaken, many children with AS do not understand some of these common social interactions and social contacts. It is important as a teacher to realize that the child may not understand some jokes and may be unable to interpret body language very well.There are several teaching strategies that can help with the social aspects of AS. Enforce bullying rules and minimize teasing. Some peers can be educated about AS and talk to understand what to expect from their fellow student. A buddy system can be helpful to students who are older. In social situations, the buddy can help the AS student handle these situations. Teach the child about social cues and help them to make friends. Most children with AS do want to have friends, they just do not know how to make them. Teachers can help by teaching the student what social cues mean. Working with children with AS involves understanding that they are often gifted student who see and experience things in a different way. Other concerns teachers should be aware of include the difficulty of many AS children to concentrate and their limited range of interests. They often lack coordination and some struggle with academics. There are teaching strategies that can work in most of these instances. Limit obsessive behavior about topics by setting a specific time in which the children can ask the focused questions. Do not allow the children to keep asking questions or discussing a topic as they wish to. Positive reinforcement works well for children with AS. When they accomplish a desired behavior, compliment then and praise the child. Even simple social interactions should be praised. 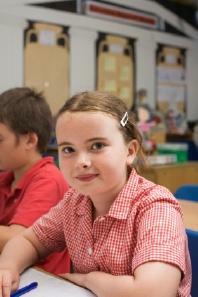 Try to seat children with AS at the front of the class so the teacher can instruct them directly and regularly. Since concentration is often a problem, develop a system of nonverbally reminding them to pay attention, such as a pat on the shoulder. For physical coordination problems, ensure a child with physical limitations is in an adaptive educational program rather than a general PE class. Academic struggle is common with children with AS. The educational program used for the students should be geared to their specific needs. Simplified lessons may be required. Ensure the child understands what is being said to them. It is common for a child to simply repeat what is being taught without understanding the concept. It may seem quite demanding to implement these teaching strategies for Asperger syndrome children, but it can be one of the most rewarding of experiences for both the teacher and the other students.